Scientists have discovered the first synthetic material that becomes thicker—at the molecular level—as it is stretched. Researchers led by Dr. Devesh Mistry from the University of Leeds discovered a new non-porous material that has unique and inherent "auxetic" stretching properties. Their findings are published today in Nature Communications. There are materials in nature that exhibit auxetic capabilities, such as cat skin, the protective layer in mussel shells and tendons in the human body. Experts have been actively researching synthetic auxetic materials for more than 30 years, but until now have only been able to create them by structuring conventional materials using complex engineering processes, including 3-D printing. These processes are time consuming, costly, and can lead to weaker, porous products. The identification of a synthetic molecular version is a major step forward for physicists, materials scientists and development companies, but researchers acknowledge that more research is needed to develop a fuller understanding of what drives the auxetic behaviour and how this behaviour can be applied commercially. Dr. Mistry, from the School of Physics and Astronomy at Leeds, said: "This is a really exciting discovery, which will have significant benefits in the future for the development of products with a wide range of applications. This new synthetic material is inherently auxetic on the molecular level and is therefore much simpler to fabricate and avoids the problems usually found with engineered products. But more research is needed to understand exactly how they can be used." He added: "When we stretch conventional materials, such as steel bars and rubber bands they become thinner. Auxetic materials on the other hand get thicker. "Auxetics are also great at energy absorption and resisting fracture. There may be many potential applications for materials with these properties including body armour, architecture and medical equipment. We have already submitted a patent and are talking to industry about the next steps." 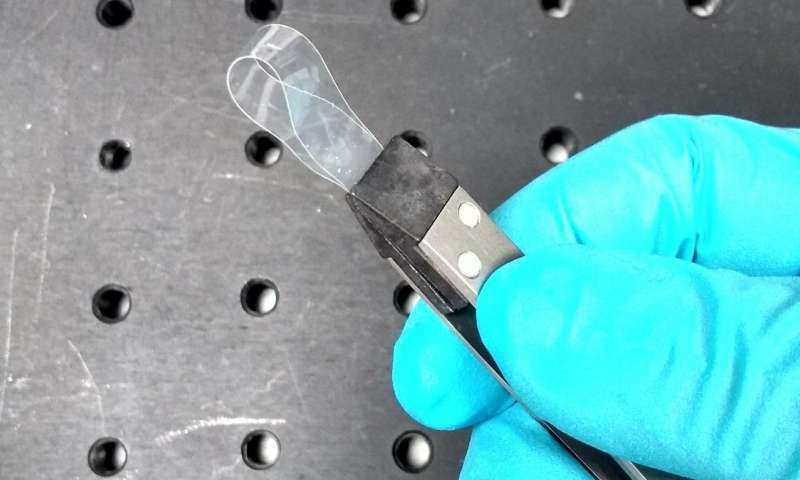 The team discovered the yet-to-be-named material while examining the capabilities of Liquid Crystal Elastomers. Liquid crystals are best known for their use in mobile phone and television screens and have both liquid and solid properties. When they are linked with polymer chains to form rubbery networks, they have completely new properties and possible applications. "Our results demonstrate a new use for liquid crystals beyond the flat screen monitors and televisions many of us are familiar with," said Professor Helen Gleeson, study co-author and Head of Physics and Astronomy at Leeds. "This new synthetic material is a great example of what physics research and exploring the potential of materials such as liquid crystals can discover. Collaboration between scientists with several areas of expertise and the extensive technical facilities we have at Leeds make this kind of exploration and discovery possible." 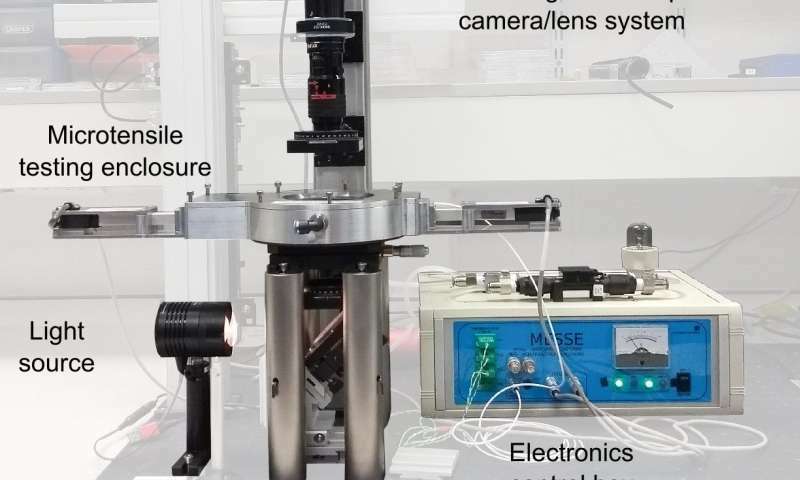 The instruments and expertise of staff in the Leeds Electron Microscopy and Spectroscopy Centre (LEMAS) at the University enabled the team to rigorously test the new material. Professor Gleeson said: "We wanted to be sure the material wouldn't break down or become porous when stretched to its limits. Our LEMAS centre had the tools to do this."